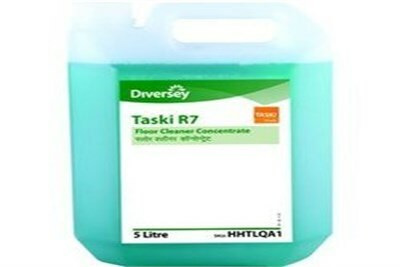 Shivaay Maintenance are amid one of the illustrious firms of the country that are willingly immersed in presenting Taski R7 Concentrated Floor Cleaner . Taski R7 Concentrated Floor Cleaner is an effective floor cleaner. It can be used for both wet mopping as well as scrubbing with a machine.Safe & effective on alltypes of floorsldeal for cleaning all bathroom surfaces like sink, tub, tiles, floor and fittings. Cleaning and disinfection with one product. Effective in all water conditions. Can be used for manual cleaning as well as machine cleaning. Normal soiling:20 ml. in 1 litre of water. Heavy soiling:50 ml. in 1 litre of water. Company Name: SHIVAAY MAINTENANCE PVT. LTD.